A new feather type in a nonavian theropod and the early evolution of feathers. 2009. Xing Xu, et al. PNAS 106: 832-834. Paleontologists have proposed that “dinofuzz” evolved before feathers. Now researchers have finally found an important yet long-missing piece of the feather lineage: single, unbranched filaments. 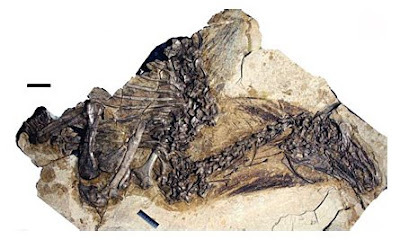 The unbranched structures appear on a newly discovered specimen of Beipiaosaurus, a feathered dinosaur that lived in what is now China about 120 million years ago. The filaments, which measure between 10 and 15 centimeters long, are broad — about 2 mm wide for most of their length. They’re found only on the creature’s head, neck and tail. The filaments probably served as display structures, just as many similarly placed feathers do on modern birds. Abstract: All described feathers in nonavian theropods are composite structures formed by multiple filaments. They closely resemble relatively advanced stages predicted by developmental models of the origin of feathers, but not the earliest stage. Here, we report a feather type in two specimens of the basal therizinosaur Beipiaosaurus, in which each individual feather is represented by a single broad filament. This morphotype is congruent with the stage I morphology predicted by developmental models, and all major predicted morphotypes have now been documented in the fossil record. This congruence between the full range of paleontological and developmental data strongly supports the hypothesis that feathers evolved and initially diversified in nonavian theropods before the origin of birds and the evolution of flight. What Killed The Dinosaurs? Now It Can Be Told! I Battled The Evolution Beasts!